"Free Shannon from the US Military"
Margaretta D'Arcy was taken from her home at 10 a.m. on Wednesday and jailed in Limerick prison. With Niall Farrell, Margaretta sat on the runway at Shannon while fellow activists called the Gardaí to remove them both for safety reasons. Margaretta had been convicted in court before Christmas, was sentenced to three months in prison and refused to sign a bond that would effectively have set her free. In prison, she remains defiant, asking that protestors demand not for her own release but the release of Shannon airport from the US military. Margaretta D'Arcy is not a war criminal. Nor is she a human rights abuser, or the commander of an invading army. But she has spent many years drawing attention to the fact that these type of people pass through Shannon Airport regularly. The legally and morally correct response from the Irish police would be to investigate this complicity in wrongdoing at Shannon. 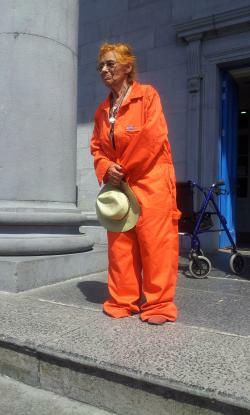 Instead they imprisoned 79 year old Margaretta because she wouldn't promise to stay away from the airport. A peace activist who draws too much attention to US and NATO injustices is locked up in supposedly neutral Ireland, while the country's morally corrupt government continues to bend over backwards to support their imperialist plundering. Ireland is obligated under customary international laws on neutrality to not allow US troops involved in wars to transit through Irish territory, and to arrest any such soldiers found on Irish territory. But the government not only refuses to do this - it even welcomes them. The imbalance in the administration of justice is staggering. Margaretta and Niall Farrell, both members of Galway Alliance Against War, went onto the runway at Shannon on 7th October 2012 as part of an international week of protest against US killer drones. These drones may well be going through Shannon on some of the many US Hercules C-130's that land there, despite the claims of our Minister for Foreign Affairs that these aircraft are unarmed, carrying no arms and are not part of military exercises or operations. These claims are meaningless, as there is photographic evidence of at least one US Hercules landing at Shannon in 2013 armed with 30mm cannon. And on that basis Margaretta and Niall's action was fully justified. Thousands of innocent people have been executed without trial by drones in Afghanistan, Pakistan, Somalia and Yemen (with the approval of President Barack Obama), and thousands more have been injured and badly mutilated. Yet the Irish government pretends Shannon is not involved, just like it pretends the airport was not involved in renditions. Margaretta and others have tried in vain to have these serious violations of international law investigated. Going onto the runway was a last resort in her efforts to have what she called a long overdue "conversation with the State". In Ennis District Court she explained why it was necessary to do what she did, but the court handed down a three month suspended sentence on condition that she sign a bond not to go back onto the runway. She refused, so the sentence was imposed. And Margaretta has ended up in Limerick Prison. Margaretta has rightly claimed that Ireland is an active ally and participant in illegal wars. The State has responded by demanding her silence and her inaction. Indeed it's not the first time it has gone to great lengths to protect the illegality being perpetrated at Shannon. Arrests, court cases, barring of activists from the airport, restrictions imposed on protests - these and other violations of civil liberties have all become par for the course in a government-led curtailment of open discussion about what's going on at Shannon. The extent to which public opinion is being ignored is evident from the fact that in a 2013 poll conducted for PANA by Red C, 78% of people expressed the view that Ireland should have a policy of neutrality. It's not something that gets spoken about by government Ministers. Indeed despite what Article 5 of the Irish Constitution says about Ireland being a "sovereign, independent, democratic state", the military-industrial complex is alive and well here, with the mainstream media giving it all the support they can muster. Margaretta and Niall Farrell are due in court again next week, on January 22nd, to answer another charge relating to action they took at Shannon. This one was on September 1st 2013 when it looked likely that the US was about to declare war on Syria. Throughout the world there was considerable fear that there would a dangerous escalation of the conflict there, and as Pope Francis was leading the faithful in prayer for an end to war in Syria, Margaretta and Niall once again made their way to Shannon to express their opposition to a US war against Syria. These actions are now forcing the State and the media to take note; sooner or later they will have to acknowledge the strong anti-war sentiment that exists throughout the country. Shannonwatch unreservedly supports Margaretta, and condemns the heavy handed approach taken by the authorities who imprisoned her. We've joined the campaign calling for her immediate release, and we will be organising protests outside Limerick Prison every week until such time as this happens. However as Margaretta herself said from prison, the ultimate objective is not just to free her, it is to free Shannon from the US Military. Finally, the term prisoner of conscience, which is used to refer to people who have been put into prison for their political or social beliefs or for breaking the law while protesting against a political or social system, fits Margaretta perfectly. In a country where the lip service being paid to human rights is ringing increasingly hollow, the significance of her action is immense. And let's hope that the renewed energy it gives to the peace movement in Ireland yields the desired results. Peace activists Margaretta D'Arcy and Niall Farrell appeared today before a packed Ennis Courthouse in relation to a protest they had both made in Shannon Airport on September 1st 2013. At that time it looked increasingly likely that the US was about to declare war on Syria. Throughout the world there was considerable fear that there would be a dangerous escalation of the conflict there, and as Pope Francis was leading the faithful in prayer for an end to war in Syria, Margaretta and Niall had once again made their way to Shannon to express their opposition to a US war against Syria and in particular to Ireland's facilitation of any such conflict. Magaretta who is 79 has, so far, served eight days of a three month sentence in Limerick Prison which was handed down by Judge Durcan who was also the judge for today's proceedings. Margaretta was transported to court in by the prison service and the court room was crowded with supporters for her and her fellow accused's anti-war activities. Today's business was to set a date for a trial in relation to their actions at Shannon on Sept 1st 2013. Inspector Tom Kennedy who was acting as state prosecutor requested that he be allowed to amend the charges upon which both activists were being prosecuted and Judge Durkan allowed this and in both cases made an order that the proceedings be postponed to February 13th 2014 which would enable Inspector Kennedy to see that both peace activists were re issued with the corrected charge sheets in respect of their cases. It is of interest that an identical error was made in the previous charges brought against both activists (on 2nd December 2013) and on that occasion applications from both D'Arcy and Farrell that they case should be thrown out due to this error were denied by Judge Durkan. Following the Judge's refusal to strike out the case Farrell made a request for legal representation in court, this was also was denied to him by the Judge Durkan on that that date. The Dec 2nd case is the one for which Magaretta is currently serving her sentence and for which Niall Farrell received a three month suspended sentence. Today however, Judge Durkan decided that he would allow the prosecution to amend the charge sheets but he stated that Farrell and D'arcy must be served with them in advance in order to allow them to prepare and so he set the case for mention on February 13th. Following the outcome of the earlier court case, Niall Farrell decided to engage Mr Peter Madden of Madden and Finucane Solicitors, Belfast to represent him. Today in court Farrell himself drew the judge's attention to the fact that Inspector Tom Kennedy had undertaken to forward all charge sheets to Farrell's solicitor in advance of today's sitting. This had not happened and as a result Mr Madden had not had the opportunity to examine the charges. In today's court Inspector Kennedy gave no explanation for not having provided the documents and so Mr Farrell was left to surmise that this was because of the need to make an application to insert the correct charge. As Margaretta D'Arcy was lead away from the court some of her supporters chanted US Military out of Shannon and tried to raise placards. They were forcibly removed by some of the approximately 20 Gardai who were present. A group of people made their way to the car park where they intended to clap for Margaretta when she emerged from the courtroom to be transported back to Limerick prison. However what actually happened was that a Garda Seargent and three other Gardai arrived at the doors and physically grabbed hold of one of the supporters (a middle aged man). When challenged, these Gardai said that the man in question was not under arrest but yet they continued to pull him by force back into the courthouse where it seems that Judge Durkan had requested that he be presented. Following this event a number of Gardai then manned the door of the courthouse and denied access to all members of the public who were there to support the anti war activists. This gave great cause for concert to all involved as one of our number had been detained without charge or reason given and was now in front of the judge without anyone there either to represent him or to act as witness to proceedings. Despite the fact that this reporter was also denied access to the court it was relayed to us that another woman, a retired school teacher of a similar age had also now been detained without being arrested or charged with any offence. Despite strenuous protestations made to the Gardai on the door by those attending the court they refused to explain by what legislation or by law they were preventing the public's access to court. The only fact that could be gleaned was that Inspector Tom Kennedy had instructed them to prevent access to the court room. One supporter undertook to contact the area Superintendent at Ennis Garda Station one Derek Smart but he has not returned her call as yet. The two detained supporters have since been released with no official charges being made against either. For the legal minds the correction to the charge sheets requested by Inspector Tom Kennedy is that regulation 4.1 subsection 14 of the Airport Bylaws of 1994 be inserted. The Airport Bylaws of 1994 rely for their legality on the Air Navigation and Transport Act 1950, as amended by the 1988 and 1998 Air Navigation and Transport Acts. The Dublin protest will be outside the Department of Justice offices on Stephen's Green at 1 pm. There will be a protest outside Labour TD, Derek Nolan's office by the Harbour Hotel near the waterfront in Galway, also at 1pm. The Limerick protest will be outside Limerick prison at 5 pm. Margaretta's jailing got an airing in the Seanad yesterday, raised by Sinn Féin TD Mr O Clochartaigh. I wish to acknowledge receipt of your email. ensure that they are not carrying weapons, or prisoners for rendition. About 150 people attended the Dublin protest. Gardaí barred the entrance, so the crowds were along the street and standing on the steps. The jailing of Margaretta D'Arcy is absolutely disgraceful - we should hang our heads in shame. Solidarity with Margaretta and ongoing resistance at Shannon Airport to Irish complicity at in imperial wars. Further thoughts on the implications of Margaretta's actions and Sabina Higgins's visit to her can be found on my blog Three Little Dogs under the heading "Margaretta's Stand"
Tomorrow, Global Women's Strike have organized a protest in London for Margaretta. It will take place outside the Irish Embassy at 17 Grosvenor Place,London SW1X 7HR. Margaretta got a (passing) mention on Vincent Browne by a guest journalist the other night on the garda corruption program. Solidarity Margaretta. Your brave action is continuing to shine a light on the cowardly behaviour of our garda and authorities regarding US planes using the airport at Shannon. The protest for Margaretta has been put forward to today Wednesday. It will take place outside Dáil Éireann from 1 pm to 2pm. Point very well made Fred about the Government waiving airport charges for US war planes and crippling the less well off with cuts and extra charges to get the banks out of difficulty and corruption. I call for the immediate release of Margaretta. The whole Irish working class must stand behind her in order that the necessary discussion on perspectives can take place. If we are all in prison it cannot. 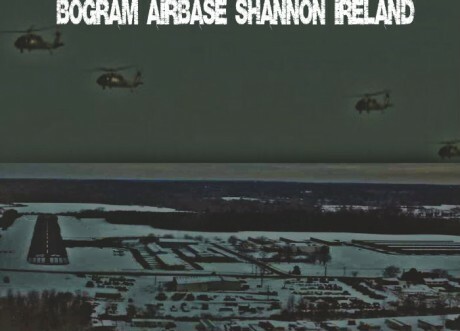 She has taken a principled stand against the US military use of Shannon Airport and has asked supporters to campaign for the release of Shannon from the same military use. It is a bit much to demand that "The whole Irish working class must stand behind her" seeing as the main support for her so far has been letters to the papers from isolated individuals whose class background is not apparent. Whoever the letter writers may be they seem to understand the issue at stake. Shannon Airport must not be turned into a refuelling depot for foreign warplanes. Yesterday's Galway Advertiser reported that Margaretta may be transferred to Mountjoy prison "next week". I presume that she would be in the Dóchas centre for Women. A supporter told the newspaper that she will not give up the fight on the issue of Shannon airport. There were about 200 protestors outside Dáil Éireann on Wednesday with plenty of press interest - and videos available as a result. Supporters plan to be there again on every Wednesday for as long as Margaretta is in prison. The latest press release from Shannonwatch tells of yesterday's visit to Margaretta in Limerick prison where her concerns are about the abuse of Shannon, for the participation of women in conflict resolution and for women prisoners' rights. Zoe Lawlor and John Lannon report. for US war planes passing through on their way to war. nefarious war purposes by the US? big responsibility for the US killings. that I don't detect any anti-American feeling around Shannon." or jobs are on offer. without some pangs of conscience. The latest of the continuing protests related to Margaretta's action and demands. Well worth watching. Mr Shatter has said that from 2004 to 2013 the Garda expenditure associated with anti-war protests at Shannon Airport amounted to over €17.3 million in security costs. "It is wrong to say that these costs are associated with anti-war protests" said Ms D'Arcy. "They are directly related to the US military use of the airport. And they demonstrate particularly poor value for money, given that our presence on the runway had to be brought to the attention of security by other peace activists." "This State has failed in its duty to protect people in many ways" continued Ms D'Arcy. "The recent European Court of Human Rights ruling in a case brought by Louise O'Keeffe demonstrated that it failed to prevent systematic child abuse. It fought her for over 15 years and refused to own up to responsibility for the abuse she suffered. In the same way it is refusing to own up for years of complicity in torture by allowing rendition planes to land at Shannon". Margaretta also spoke of her action at Shannon as a legitimate act of non-violent direct action which has been used, among others, by the civil rights movement in the United States of America and the women's suffragette movement. "Non-violent direct action is an effective means of creating change in the world, unlike violence and war which motivate revenge and retaliation and escalation of conflict. My non-violent action demonstrated an unwillingness to participate in what is happening at Shannon. Others including the Catholic Workers and Mary Kelly have felt compelled to take similar action as a result of the shameful participation of the airport in illegal wars". Margaretta D'Arcy and Niall Farrell are due to appear in Ennis District Court again on Thursday 13th February in relation to their second non-violent direct action at Shannon in September 2013.This occurred at a time when there was a likelihood that the U.S. would invade Syria, once again using Shannon as a transit base. 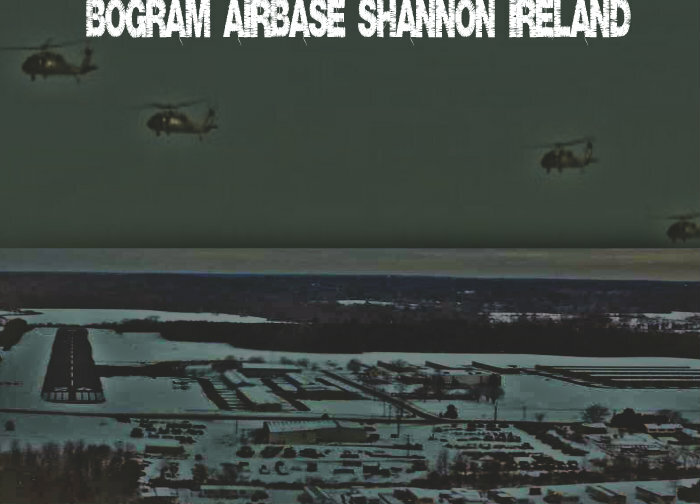 Shannonwatch spokesperson John Lannon added "In the meantime, armed US soldiers are still transiting through Shannon Airport in chartered flights and on US military aircraft. This is occurring without any evident oversight of the dangerous munitions being transported. It would also seem that there are no procedures in place to check if suspected war criminals are included as passengers on these aircraft, or to ensure that international laws are not being broken". Shannonwatch have organised a further demonstration outside Limerick Prison where Margaretta D'Arcy is being held for Friday February 14th at 8pm. Demonstrations will also take place at The Spire in Dublin on 15th and 22nd February, calling on the State to Free Margaretta D'Arcy and get the U.S. military out of Shannon. For more information email shannonwatch@gmail.com or phone 087 8225087. Sinn Féin president Gerry Adams is due to visit Margaretta D’Arcy in Limerick Prison this afternoon, where she is being held over her refusal to sign a bail bond to stay out of unauthorised areas of Shannon Airport. Ms D’Arcy (79), who is suffering from cancer, is serving a three-month prison sentence over her refusal to sign the bond. Two TDs, Clare Daly and Mick Wallace visited Margaretta in prison yesterday. Om Wednesday another big protest took place at the wind and rain-swept gates of the Dáil, where we succeeded in planting yellow ribbons on the railings there. Shanonwatch have advised that their demo outside Limerick prison has been cancelled this evening as Margaretta is being transferred to Dóchas (the women's wing near Mountjoy) today. 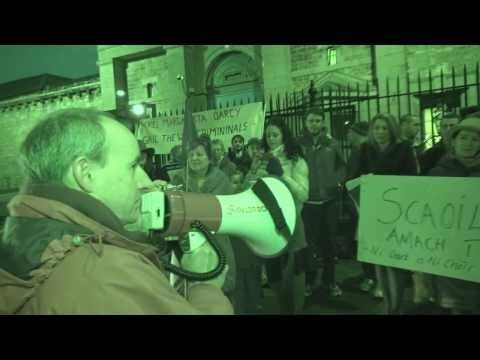 Tommy Donnellan has posted a video of a warm welcome/vigil for Margaretta that took place outside Mountjoy on Thursday night, Stephen Bennett is on the mic. On Sunday, 16 February Dublin saysNo organized a stirring march from the Central Bank of Ireland to Dóchas prison near Mountjoy and back. They stayed outside the gates shouting their support for Margaretta. Gardaí and prison staff appeared supportive. The weekly protest to free Shannon and Margaretta took place on a bitterly cold day Wednesday last. The mortgage protest was side by side with us. Both protests were well attended and the usual TDs came out in support. On Wednesday 5 March 2014 another lively protest took Place outside Dáil Éireann. The usual suspects were all present and it was a pleasure to see veteran peace and anti-war campaigner Ciaron O'Reilly among the throng. Diarmuid Breathnach conducted a rousing chorus in which part of the refrain was "FREE MARGARETTA. FREE HER NOW"
Eugene McCartan kept the passing public aware of the Shannon controversy. A sizeable number of TD's mingled and Joan Collins praised Margaretta for her action saying that she had done something that was really wonderful. Margretta D'Arcy's brave stance is being used to sell T shirts while the world is threatened by the prospect of war between nuclear-armed states . Her imprisonment has featured in seven of the last eight articles on the Irish Anti-war Movement's website while the IAWM has published no statement of its own in relation to the crisis in the Ukraine. When she refused to obey the court D'Arcy knew that she would be imprisoned and knew that an undertaking to comply with the court's ruling would secure her freedom . She urged anti-war activists NOT to focus their campaign on her imprisonment. Margaretta was on the saturday night show tonight.